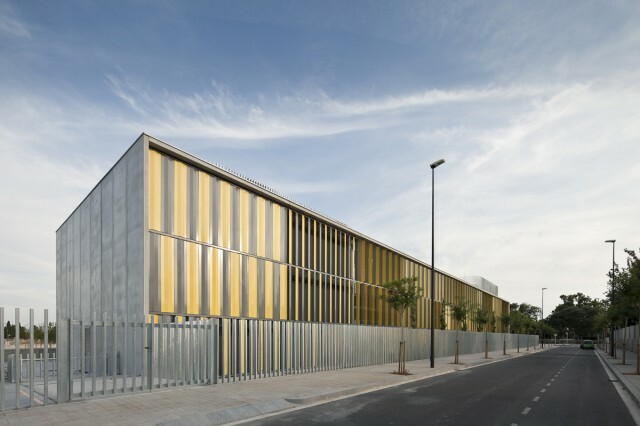 The proposal for the new secondary school in Reus came out of a public competition tender the practice was awarded in 2010. 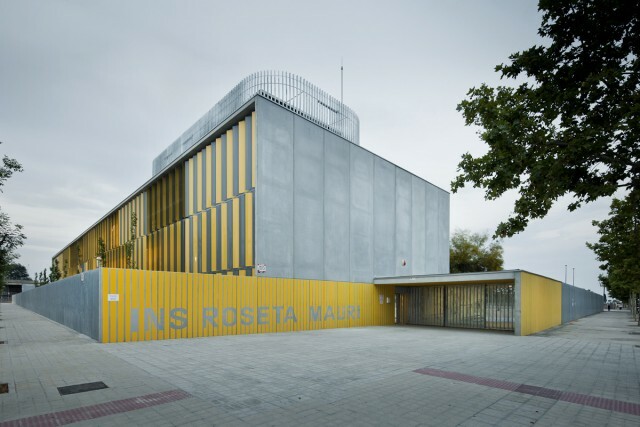 The project is based on the strictly standardized parameters of the public administration in an attempt to unify schools and use industrialized construction criteria to optimize construction times and costs, and minimize subsequent maintenance. 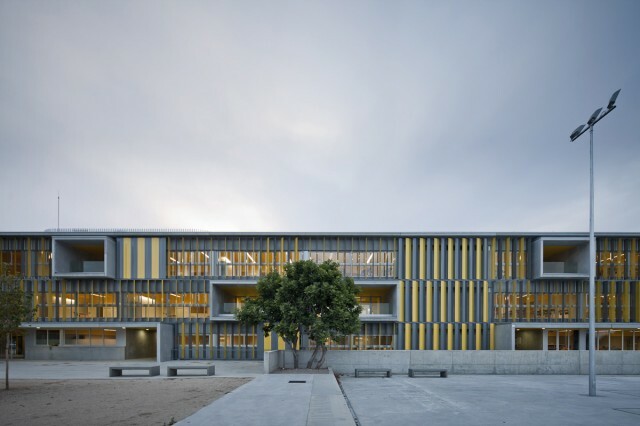 The project describes a rectangular-based building of 77.40 x 16.50 m, which only modifies its morphology on the ground floor of the facility to create porches around the school. 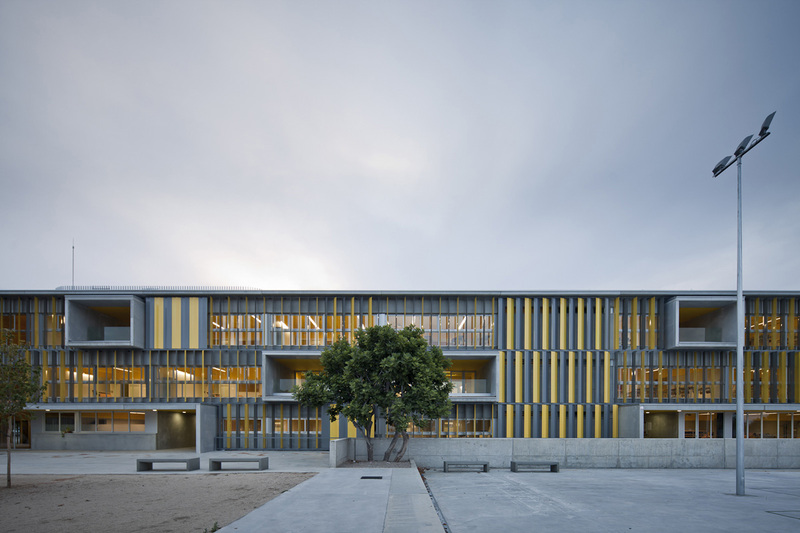 The building is defined by a basic structural module of 7.70 x 6.75 m, corresponding to the size of the standard secondary education classroom. 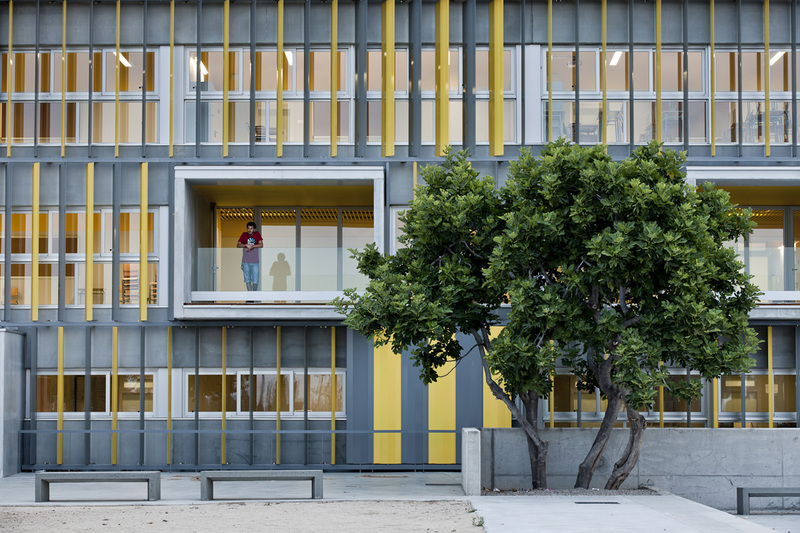 This compact building minimizes the economic repercussion of the façades by implementing a simple organizational approach to standardize construction and structural elements, allowing for prefabrication. 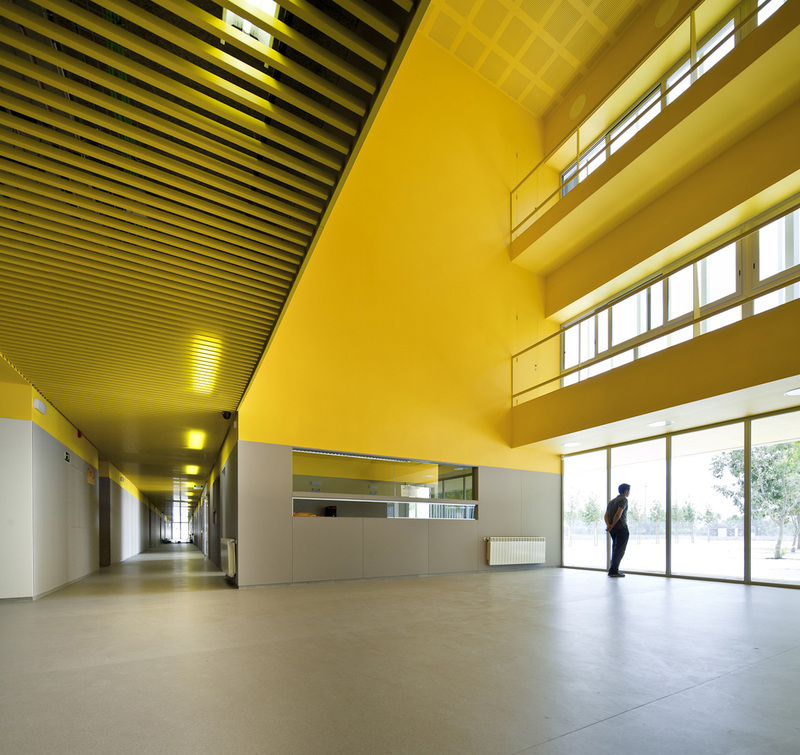 The building is drawn back from the plot boundaries, bringing all the facilities into contact with open spaces on the premises. 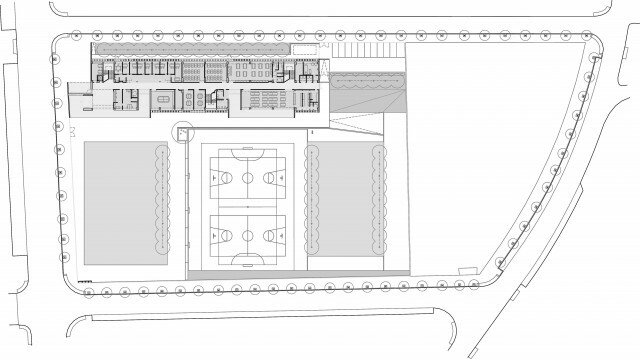 The classrooms and other spaces do not have a direct visual relation with the street, instead overlooking the open expanses of the sports courts and playgrounds, or the garden that separates the school from the street. As a consequence of freeing up the boundaries, a stretch of land on the corner closest to the town centre was opened up to public space, providing the school with a large entrance (loss becomes gain). This approach connects with the porches on the ground floor that communicate with the entrance foyer and the playground area. The high-ceilinged foyer marks the start of internal circulation. 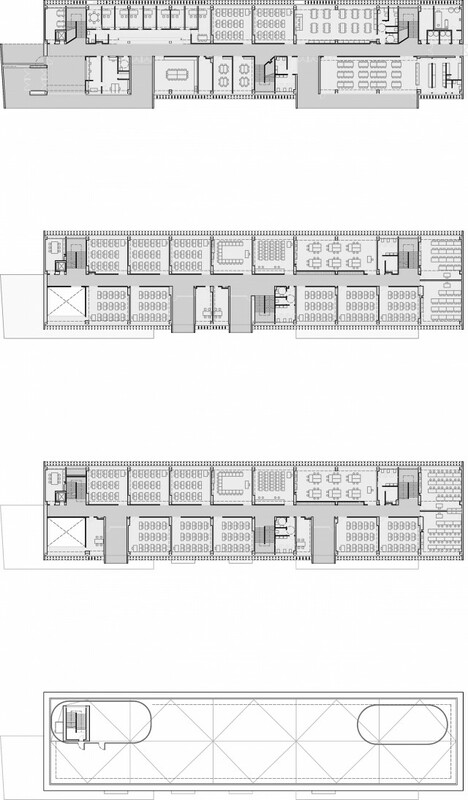 Starting at this point, the building is laid out around a central corridor that develops a system of communal spaces as it advances, generating wider spaces for future meeting places (foyer, stairs, locker areas, etc.). 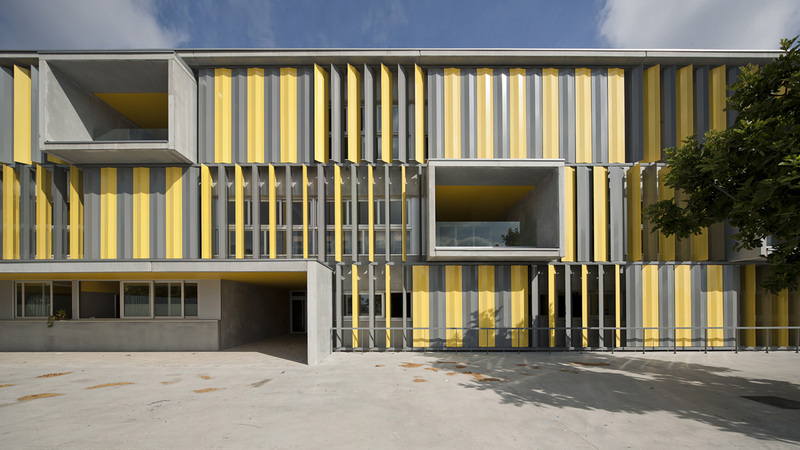 Some of these widenings extend as far as the façade, creating outdoor porched spaces that become multiuse spaces depending on the users, be they pupils or visiting teachers. 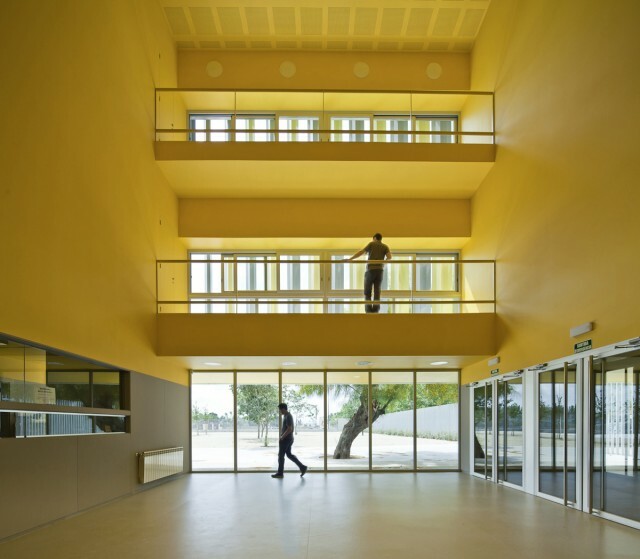 These exterior spaces, together with the stairs and the foyer, give the central corridor natural light and generate cross ventilation to facilitate thermal comfort during hot weather. The façades of the classrooms face south-east and north-west. 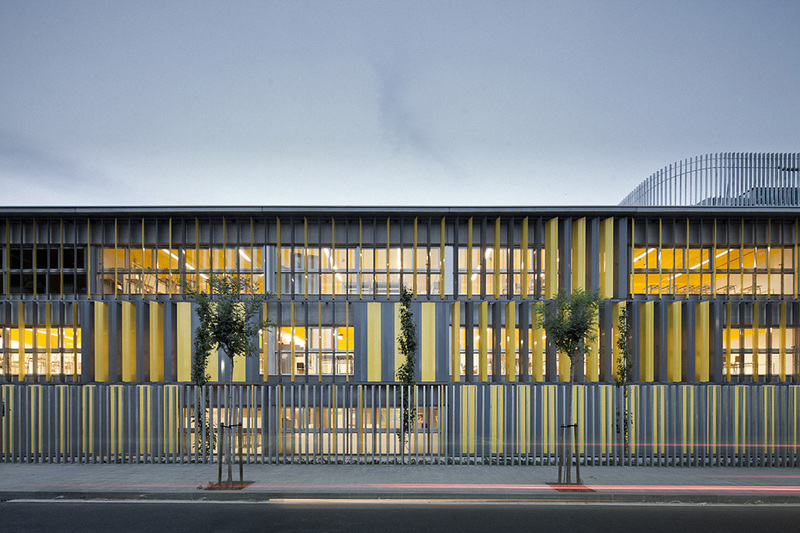 These two façades are clad with a system of vertical slats to allow optimum light control throughout the day in all the interior spaces, as well as contributing to thermal comfort in the summer months. 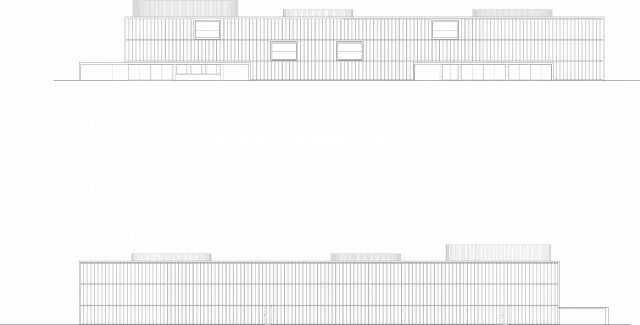 The two remaining façades are left blind in contrast with them. 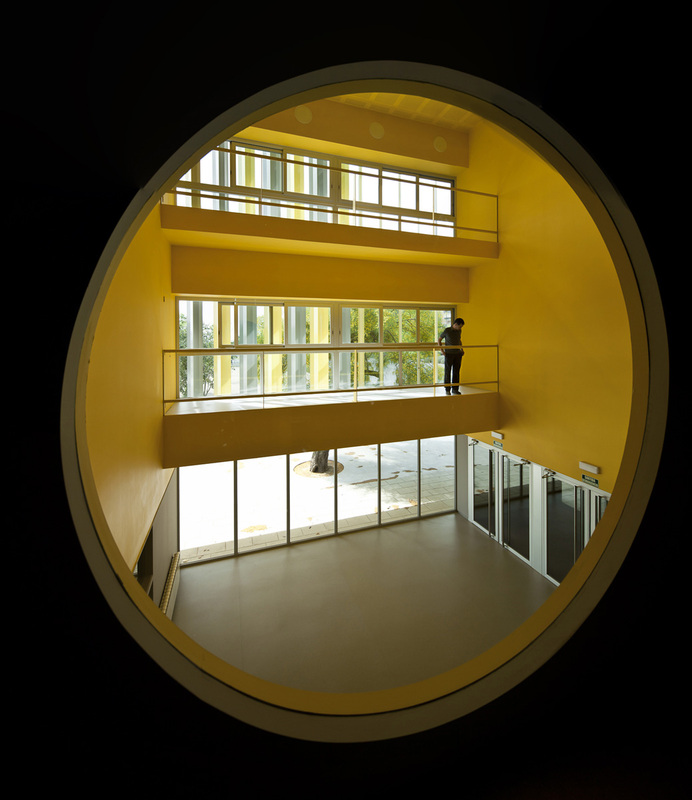 Finally, the chromatic unity granted by the colour yellow organizes the interior spaces and connects them with the façades, creating inside-outside continuity. 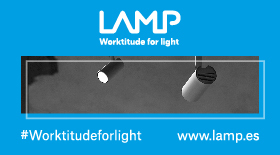 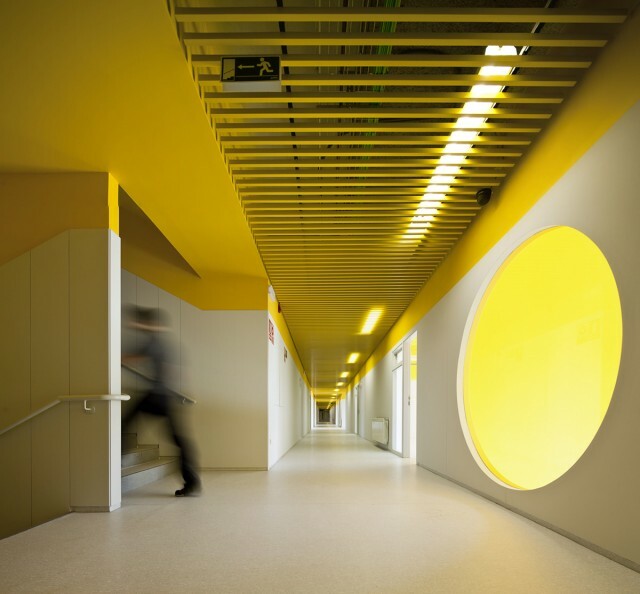 Yellow inundates the ceilings and gives a golden tint to the reflected daylight, generating new atmospheres that encourage learning by making the classroom a brighter, more user-friendly place. 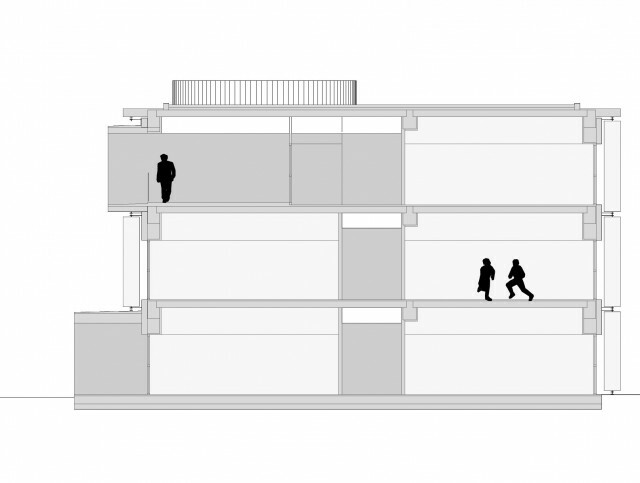 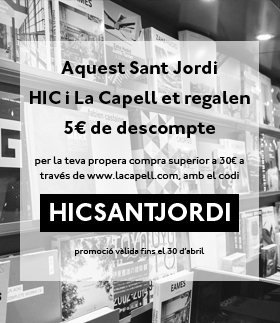 Un proyecto muy inspirador para nuevas generaciones, enhorabuena a los arquitectos!